UK foreign secretary Jeremy Hunt just urged “allies to commit to Yemen peace process”. And at the United Nations General Assembly (UNGA) on 27 September, he hosted international partners to “press for a peaceful solution to the crisis”. An official video posted by the foreign office, meanwhile, added that “Britain is leading diplomatic efforts to end the crisis”. It’s unclear how Hunt kept a straight face, though. Because while he pretends that the UK government supports a ‘political process’ in Yemen, Britain is still arming Saudi Arabia to the teeth – in spite of numerous war crime allegations. Talking to Kay Burley of Sky News, Hunt claimed that the crisis in Yemen “is not going to be solved with a military solution” and that “there has to be a political process”. And he’s right. But these are strange words given that the UK has supplied Saudi Arabia with more than £4.6bn worth of arms since 2015 – a period during which the country has committed “horrific war crimes” in Yemen, including massacres of children and other civilians. 'This is not going to be solved with a military solution' – Jeremy Hunt tells @kayburley that he has spoken to Saudi Arabia in the strongest possible terms over their bombing of Yemen. According to Campaign Against Arms Trade (CAAT), these arms range from helicopters and drones to armoured vehicles and tanks. In 2016, moreover, the UK government admitted that British-made cluster bombs had been deployed in the conflict. As recent revelations have shown, foreign-made arms can then quite easily be dropped on buses of Yemeni schoolchildren or civilians shopping in markets. In fact, Saudi airstrikes face accusations of “deliberately attacking civilians and infrastructure in rebel-held areas”. I spoke to the Saudi Arabian foreign minister in the strongest possible terms… They are having an investigation. They will hold the individuals responsible to account. Unsurprisingly, past Saudi-led investigations have found Saudi Arabia to be innocent. And yet the UK government shows no signs of ending arms sales to Saudi Arabia. 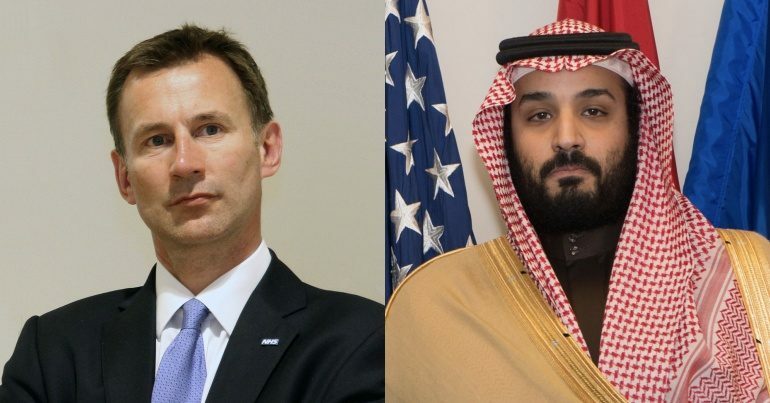 In a self-congratulatory video posted on Twitter, Hunt asked: “What is Britain’s role in the world?” He continued, “sometimes we’re a bit pessimistic about our influence and about our global reach… but we are an incredibly important player”. This is cynical propaganda. People are not simply ‘pessimistic’ about Britain’s waning global influence. Many are concerned about the government’s unending support for child-killers in Saudi Arabia (and elsewhere). Hunt’s statements following the UNGA are a blatant attempt to conceal the UK’s deadly role in the war on Yemen. The truth is that Britain is not leading meaningful diplomatic efforts to end the crisis – it is sponsoring one of the world’s worst humanitarian catastrophes. And that is utterly unacceptable. – Support Campaign Against Arms Trade (CAAT). – Read more of The Canary’s coverage of the war on Yemen. Get your law books out. The Tommy Robinson saga has gone full Inception.